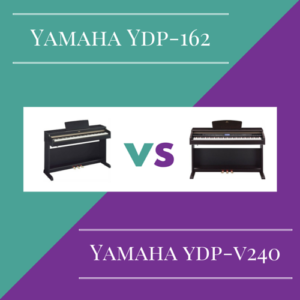 You are here: Home / Yamaha Digital Pianos / Yamaha YDP 162 vs Yamaha YDP V240: Which is Better? Yamaha YDP 162 vs Yamaha YDP V240: Which is Better? Looking to purchase a new digital piano? You might be familiar with the brand Yamaha but if that’s as far as your expertise goes, don’t worry. All of the heavy lifting is done for you in this review. We place two Yamaha digital pianos head to head in a 4-Round feature fight to the finish. So which comes out on top in this battle betwee: The Yamaha Arius YDP 162 vs Yamaha Arius YDP V240. Do note that the Yamaha YDP-162 has been replaced by the newer Yamaha YDP-163, which we reviewed here. The YDP 162 emulates the elegance of an acoustic upright with its furniture-like design and wood finishes. 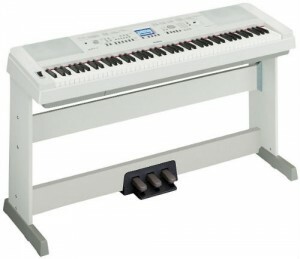 It holds the basic abilities, which every digital piano needs to possess–weighted keys and an authentic quality sound. 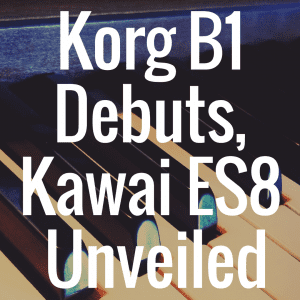 The 162 is a full 88-key piano with weighted Yamaha graded hammer standard keys. 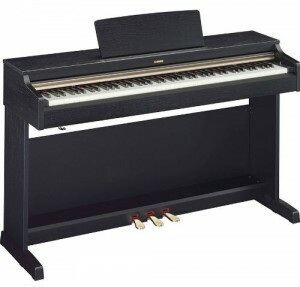 Yamaha graded hammer keys mimic the natural weight of an acoustic piano where the lower tone notes are more weighted than the upper register of the piano. 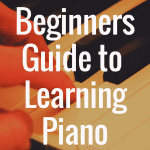 As the skill level of a pianist increases, weighted keys become increasingly more important in the development of the one’s abilities. The 162 keeps it light and simple on the list of features. The USB port allows the piano to be connected to a computer for more advanced recordings and compositions. The most prominent feature, in fact, is the 2-track recorder, which is best used to record a performance and playback to hear progress without the need for additional technology. A sound bank of 10 voices allows a few more options in sound, however the richest and most useful is the grand piano tone. This piano has 128-note polyphony, which ensures all notes are heard during a performance, even through more advanced playing styles of sustained chords with heavy pedal triggers. The focus of this piano is to allow a pianist to aspire to new heights and develop a professional sound and technique. The YDP – V240 offers a hefty amount of sounds and features, which surpass the average needs of a typical pianist. This piano plays more into the creative process of composition. The V240 has a unique song arrange feature, which gives the user the ability to change the style of a prerecorded song. The user can also change the voicing of the melody and the keyboards voice to completely change the arrangement to a unique individual interpretation. The V240 also has performance assistant technology which guides any user–beginner or advanced–into a masterful performance of a prerecorded song on the piano. This is helpful for an impromptu request from family or just a fun sing along of your favorite classic melody. The USB to Host feature allows the piano to connect to computers to increase the versatility of the piano. This piano also connects to a USB memory device to store user created songs or read MIDI data from the connected device. As a composer, the V240 has an overload of features and functions used to create music with or without a computer or any additional technology. The YDP V240 allows the user to simply play the piano with a robust sound output and create full compositions masterfully layered with sounds. The YDP 162 is taller than its previous Arius models, which creates a deeper cabinet sound and a rich warm tone. The PureCF sound engine is based on recordings of Yamaha’s classic concert grand pianos. This engine captures the realistic dynamics of playing an acoustic piano and changing your touch from pianissimo to fortissimo with ease. The YDP also offers synthetic ivory key tops for its weighted keys. This is suitable for advanced players as well as beginners. It assists in developing the realistic playing control needed to play comfortably for long periods of time on an acoustic piano. 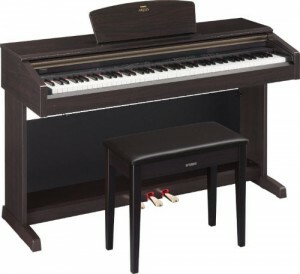 Comparitively, the Yamaha YDP-V240 matches the 162 in its height and deeper cabinet to mimic a true Yamaha upright tone. Also the V240 sound bank is designed based on the advanced wave memory (AWM) sampling system, which is based on capturing the dynamic response of touch from an acoustic piano in relation to the sound produced. The V240 captures this in a higher, more expressive quality than the 162–however the differences are honestly minute in comparison by the natural ear. The V240 is a clear step up in creating an environment of sound, this being the reverb and how the sound seemingly reflects and fills up a room. The V240 allows the user to control the environment of the sound through digital signal processing (DSP). The user can enhance the sound through additional effects layered on top of the natural tone or completely distort the sound to create a seemingly new and unique tone quality with a few simple clicks. The quality of sound and its dynamic response to touch are matched between the 162 and V240, however if we’re counting purely sound to sound in terms of volume, the 162 is outnumbered by a mile. The V240 holds a built-in 500+ sound bank of voicings in comparison to the 162’s 10 voice sound bank. The V240 also has the ability to layer sounds, which creates almost an unmatched number of unique user defined sounds. 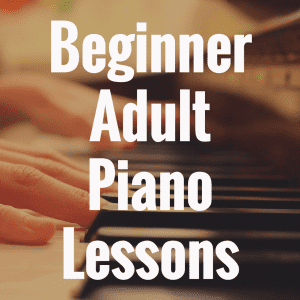 From beginners to those that consider themselves advanced players, you want your instrument to provide you with an almost flawless response when you begin playing those black and white keys. But one general disadvantage to playing involves the yield to quick repetition of one note. In order to accommodate this, grand pianos picked up improvements to rapid repeated note response–however, this translated to digital pianos as 2 or 3 senor keyboards. The YDP 162 and V240 are both 2 sensor keyboards which could cause a problem the more advanced the pianist becomes. Realistically, the biggest disadvantage of the V240 is the price. It offers a vast sea of features and has amazing sound quality, however its competition in other brands such as a Williams digital piano, offer comparable features and functions at a lower price point. Also if your goal as a pianist is to purchase for its composition features, there are plenty of computer programs that could potentially replace every feature available on the V240 with ease. Yamaha has a large catalog of pianos–digital, upright, and grand. The YDP 162 and V240 have a few key competitors within the Yamaha brand as well as outside the brand. So let’s dig right into all of them and see how well the 162 and V240 stack up when it’s all said and done. 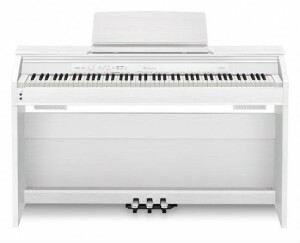 The Yamaha YDP-181, for example, is essentially the same instrument as the YDP 162–expect it has a MIDI port. This is key when connecting a piano to another MIDI controller to create a larger workstation or to use the sounds from the piano and send them to your computer to be used in a Digital Audio Workstation (DAW). If composition and creation are criteria that are important to you, then the YDP 181 edges out the YDP 162 just slightly. However, against the V240, it falls short in the same ways as the 162. Feature to feature, the Yamaha YDP-S52 goes pound for the pound in comparison to the YDP 162. The difference comes mostly in the appearance. The S52 is only available in black and white finish, and carries a cheaper quality look to its design. The advantage goes to the 162 and the V240 for quality of build and overall appearance. Now, the Casio PX-860 is a quality instrument. It offers fully weighted keys and has a favorable design to an acoustic upright. Among the other pianos listed, it is substantially the lightest build at 78.26 lbs. 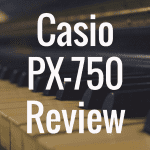 The PX-860 also has MIDI and USB ports, which are always an advantage in connecting the piano to other technology and increasing the uses of the piano. However, the sound quality of the Casio in comparison to the Yamaha is noteworthy of discussion here. 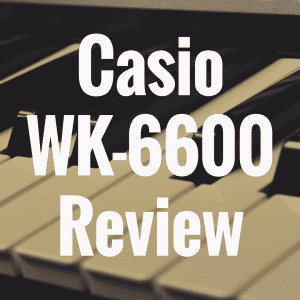 The Casio has a bit of a thinner sound, where the Yamaha carries a warmer tone (although different ears will of course hear different things, to an extent). Still, this makes sense because Casio is a digital piano company; its sound bank is always best placed in a DAW for digital composition. In a DAW, the sounds are manipulated to create the desired tone of the composer. Let’s now move onto the the Yamaha DGX 660 (which recently replaced the super-popular DGX-650). The DGX-660 is a portable 88-key keyboard with Yamaha’s Graded Hammer Standard key action and PureCF sound engine. Its features relate more to the YDP V240, but at a considerably lower price point due to its appearance and design. Having the features of the V240 in a portable keyboard adds more value to the piano. This allows the user to create music in almost any setting. A pianist in a band with a vocalist could potentially layer sounds and create backing tracks to accompany the vocalist with a drum track, piano, and strings layered at the press of a button. This model also has the new feature of a mic input so that the user can sing along as they play. Most impressively, the DGX has the ability to connect wirelessly to an iOS device to stream audio, MIDI, and utilize a chord tracker app to display chord symbol to the user. Neither the V240 nor the 162 have the ability to do this. The possibilities are endless with the amount of features and controls the DGX 660 affords the user in any setting. If portability and price are important factors to you, the DGX 660 is a great choice for a digital piano. 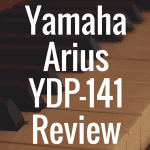 In a competition of Yamaha against Yamaha–arguably one of the best digital piano brands on the market today– the choices are usually between “better” and “best.” In this case, the better choice, when all of the categories are reviewed and analyzed, is the Yamaha Arius YDP 162. The YDP V240 offers a barrage of additional on-board features and functions that seemingly outweigh the YDP 162 hands down, and would be worth the extra money if you have a bit more disposable income. However, with the development of technology and ease of access, the ability to compose songs is available as a program on most if not all computer platforms for free. To name a couple–Reaper is available for free on Windows based computers and Garageband comes standard on all Apple computers. These DAWs (Digital Audio Workstations, which we discussed earlier) are a drop in the barrel of available DAWs for every level of composer. Each of these DAWs generally comes with a sound bank of at least 100 or more sounds to start with, and more sounds available for purchase if needed. They essentially allow the user to connect their piano through USB to a computer and compose with ease. These programs substantially even the playing field between the YDP 162 and the YDP 240. The quality of sound produced by each piano is comparable, as well as the quality of the build of each piano. The biggest differences now are the price points. From the beginner to the advanced pianist looking to purchase a piano with a professional appearance and sound quality, the YDP-162 really does give you a great bang for your buck. 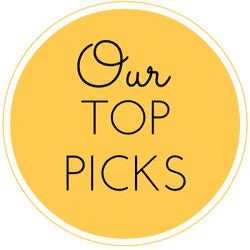 Please bookmark Digital Piano Review Guide and take a quick moment to “like” our Facebook page! What’s the Best Yamaha Upright Digital Piano?